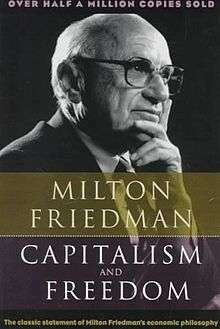 Capitalism and Freedom is a book by Milton Friedman originally published in 1962 by the University of Chicago Press which discusses the role of economic capitalism in liberal society. It sold over 400,000 copies in the first eighteen years and more than half a million since 1962. It has been translated into eighteen languages. Friedman argues for economic freedom as a precondition for political freedom. He defines "liberal" in European Enlightenment terms, contrasting with an American usage that he believes has been corrupted since the Great Depression. Many North Americans usually categorized as conservative or libertarian have adopted some of his views. The book finds several realistic places in which a free market can be promoted for both philosophical and practical reasons, with several surprising conclusions. Among other concepts, Friedman advocates ending the mandatory licensing of doctors and introducing a system of vouchers for school education. Capitalism and Freedom was published nearly two decades after World War II, a time when the Great Depression was still in collective memory. Under the Kennedy and preceding Eisenhower administrations, federal expenditures were growing at a quick pace in the areas of national defense, social welfare, and infrastructure. Both major parties, Democratic and Republican, supported increased spending in different ways. This, as well as the New Deal, was supported by most intellectuals with the justification of Keynesian economics. The introduction lays out the principles of Friedman's archetypal liberal, a man who supports limited and dispersed governmental power. Friedman opts for the continental European, rather than American, definition of the term. In this chapter, Friedman promotes economic freedom as both a necessary freedom and also as a vital means for political freedom. He argues that, with the means for production under the auspices of the government, it is nearly impossible for real dissent and exchange of ideas to exist. Additionally, economic freedom is important, since any "bi-laterally voluntary and informed" transaction must benefit both parties to the transaction. According to the author, the government of a liberal society should enforce law and order and property rights, as well as take action on certain technical monopolies and diminish negative "neighborhood effects." The government should also have control over money, as has long been recognized in the constitution and society. He discusses the evolution of money in America, culminating in the Federal Reserve Act of 1913. Far from acting as a stabilizer, the Federal Reserve failed to act as it should have in several circumstances. Friedman proposes that the Federal Reserve have a consistent rule to increase the money supply by 3-5% annually. This chapter advocates the end of the Bretton Woods system in favor of a floating exchange rate system and the end of all currency controls and trade barriers, even "voluntary" export quotas. Friedman says that this is the only true solution to the balance of trades problem. Friedman argues against the continual government spending justified to "balance the wheel" and help the economy to continue to grow. On the contrary, federal government expenditures make the economy less, not more stable. Friedman uses concrete evidence from his own research, demonstrating that the rise in government expenditures results in a roughly equal rise in GDP, contrasting with the Keynesian multiplier theory. Many reasons for this discrepancy are discussed. The policy advocated here is vouchers which students may use for education at a private school of their choice. The author believes that everyone, in a democracy, needs a basic education for citizenship. Though there is underinvestment in human capital (in terms of spending at technical and professional schools), it would be foolish of the government to provide free technical education. The author suggests several solutions, some private, some public, to stop this underinvestment. In a capitalist society, Friedman argues, it costs money to discriminate, and it is very difficult, given the impersonal nature of market transactions. However, the government should not make fair employment practices laws (eventually embodied in the Civil Rights Act of 1964), as these inhibit the freedom to employ someone based on whatever qualifications the employer wishes to use. For the same reason, right-to-work laws should be abolished. Friedman states, there are three alternatives for a monopoly: public monopoly, private monopoly, or public regulation. None of these is desirable or universally preferable. Monopolies come from many sources, but direct and indirect government intervention is the most common, and it should be stopped wherever possible. The doctrine of "social responsibility", that corporations should care about the community and not just profit, is highly subversive to the capitalist system and can only lead towards totalitarianism. Friedman takes a radical stance against all forms of state licensure. The biggest advocates for licenses in an industry are, usually, the people in the industry, wishing to keep out potential competitors. The author defines registration, certification, and licensing, and, in the context of doctors, explains why the case for each one of these is weaker than the previous one. There is no liberal justification for licensing doctors; it results in inferior care and a medical cartel. Friedman examines the progressive income tax, introduced in order to redistribute income to make things more fair, and finds that, in fact, the rich take advantage of numerous loopholes, nullifying the redistributive effects. It would be far more fair just to have a uniform flat tax with no deductions, which could meet the 1962 tax revenues with a rate only slightly greater than the lowest tax bracket at that time. Though well-intentioned, many social welfare measures don't help the poor as much as some think. Friedman focuses on Social Security as a particularly large and unfair system. He advocates a negative income tax to fix the issue, giving everyone a guaranteed minimum income, rather than current measures, which he sees as misguided and inefficient. The conclusion to the book centers on how, time and time again, government intervention often has an effect opposite of that intended. Most good things in the United States and the world come from the free market, not the government, and they will continue to do so. The government, despite its good intentions, should stay out of areas where it does not need to be. The effects of Capitalism and Freedom were great yet varied in the realm of political economics. Some of Friedman's suggestions are being tested and implemented in many places, such as the flat income tax in Estonia (since 1994) and Slovakia (since 2004), a floating exchange rate which has almost fully replaced the Bretton Woods system, and national school voucher systems in Chile (since 1981) and Sweden (since 1992), to cite a few prominent examples. However, many other ideas have scarcely been considered, such as the end of licensing, and the abolition of corporate income tax (in favor of an income tax on the stock holder). Though politicians often claim that they are working towards "free trade," an idea the book supports, few American politicians have considered taking his suggestion of phasing out all tariffs in 10 years. Nevertheless, Friedman popularized many ideas previously unknown to most outside economics. This and other works helped Milton Friedman to become a household name. The Times Literary Supplement called it "one of the most influential books published since the war." Capitalism and Freedom made the Intercollegiate Studies Institute's 50 Best Books of the Twentieth Century and also was placed tenth on the list of the 100 best non-fiction books of the twentieth century compiled by National Review. In 2011, the book was placed on Time Magazine's top 100 non-fiction books written in English since 1923. ↑ Martin Carnoy (August 1998). "National Voucher Plans in Chile and Sweden: Did Privatization Reforms Make for Better Education?". Comparative Education Review. 42 (3): 309–337. doi:10.1086/447510. JSTOR 1189163. Milton Friedman's Hidden Anarchism in Capitalism and Freedom By Andrew Chrucky, 2008. A Tract for the Times — contemporary review from The Economist, 16 February 1963.